From the Heart, Through the Court, For the Community! 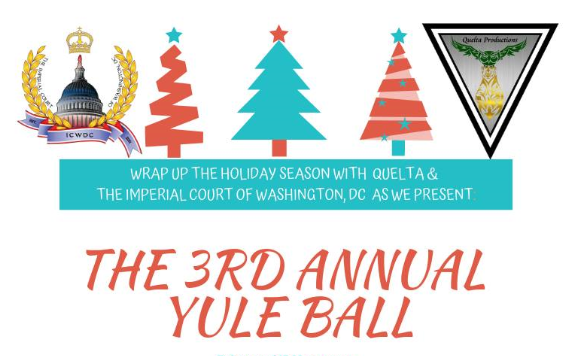 The Imperial Court of Washington, DC Yule Ball will be held on Saturday, January 5th, 2019 from 6:00 pm to 10:00 pm at The Sphinx Club (also known as The Almas Temple). The Sphinx Club is located at 1315 K Street NW in Washington, DC and is across the street from Franklin Square and the McPherson Metro. The Yule Ball will feature a buffet dinner, cash bar, and a silent auction. Tickets are $45 each ($47 if you are purchasing through PayPal) and we prefer you purchase no later than December 29, 2018. Your purchase of a ticket is your RSVP to the event! Click here to purchase your tickets. We have other wonderful sponsorship opportunities available. Interested in being a sponsor for the Yule Ball? Please contact Greg Alan “Queen Issa Fella” Moffett for more information. All proceeds will benefit local charities. Tickets to the Yule Ball are $45 each ($47 if you are purchasing through PayPal) and we prefer you purchase no later than December 29, 2018. Your purchase of a ticket is your RSVP to the event! Sponsorship package tickets are also available. Please be aware of the terms and conditions of this transaction. Select the type of ticket being purchased. Specify the guest(s) name for each ticket. When the PayPal shopping cart displays, you can increase the quantity of tickets be purchased at that time. Just make sure that you have specified a guest name for each ticket. Sponsorships are $600 ($618 if package is purchased through PayPal – see above for purchasing the package using PayPal. By participating as a sponsor for this event, you will also receive discounted sponsorship opportunities at all other events throughout this year. Sponsorship is 100% tax deductible – tax receipt provided at the time of purchase. Please be aware of the terms and conditions of this transaction. For more information or a custom sponsorship package, please contact Greg Alan “Queen Issa Fella” Moffett. The above PayPal donation amounts include nominal credit card transaction fees. To avoid the credit card transaction fees, you may mail a business or court check, drawn on a US bank in US funds, made out to “ICWDC” or “Imperial Court of Washington DC” to:Imperial Court of Washington DC, Attn:Tickets, PO Box 2616, Washington, DC 20013. By selecting one of the above options for our event, you are making a donation to the ICWDC and it’s charities, which is non refundable. If you are unable to attend, we urge you to donate your tickets to someone who would be otherwise unable to. We thank you for your continued support.